Describe the stages in the breakdown of organic matter. Why do stems and leaves degrade at different rates? What is mineralisation of organic matter? What is the immobilisation of nutrients? What is the C:N ratio of organic matter and why is it important? Question 1. Describe the stages in the breakdown of organic matter. Organic matter breakdown is not a single chemical transformation but a complex process. Break down of organic matter involves chemical alteration of organic matter, physical fragmentation and finally release of mineral nutrients. Organic matter break down is a biological process because it is the soil organisms (microorganisms, earthworms, microarthropods, ants beetles etc) that perform the chemical and physical changes. Different organisms are involved with the different stages of these processes. Break down starts almost immediately after the organism, or part of it, dies. The organic material is colonised by micro-organisms that use enzymes to oxidise the organic matter to obtain energy and C. For leaves and roots their surfaces are colonised by microorganisms even before they die. Soil animals such as earthworms assist in the decompostion of organic matter by incorporating it into the soil where conditions are more favourable for deocmpostion than on the surface. Earthworms and other larger soil animals, such as mites, collembola and ants, fragment organic material increasing the surface area and allowing more microorganisms to colonise the organic matter and decompose it. During decomposition the organic molecules in organic matter are broken down into simpler organic molecules that require further decomposition or into mineralised nutrients. The compounds in organic matter vary in the ease with which microorganisms can break them down. The first organic compounds to be broken down are those that are easy to break down, incluing amino acids and sugars. Cellulose will break down more slowly and lignin, phenols and waxes will remain in the soil for the longest time. Question 2. Why do stems and leaves decompose at different rates? Stems and leaves decompose at different rates because they are made up of different kinds of molecules that require different enzymes for their degradation. Leaves generally have more cellulose than lignin. Stems generally have more lignin than leaves. Cellulose is a simpler molecule which is able to be decomposed by microorganisms more quickly than lignin. Cellulose tends to be a straight, chain-like molecule. Lignin has a complex, folded structure so the enzymes cannot break up the component parts quickly. When lignin is linked within the plant cell walls with cellulose, it makes it harder to degrade the cellulose. After 10 weeks, most parts of leaves will have been degraded, but it may take about 30 weeks to degrade the same amount of stem material. Question 3. What is mineralisation of organic matter? This needs to be considered in terms of carbon, nitrogen, phosphorus and sulphur. Mineralisation is the biological process where organic compounds in organic matter are chemically converted by the microorganisms in soil to simpler organic compounds, other organic compounds or mineralised nutrients. Bacteria and fungi are responsible for most of the mineralisation of organic matter in soils. Microorganisms release enzymes that oxidise the organic compounds in organic matter. The oxidation reaction releases energy and carbon, which micro-organisms need to live. The final end product of mineralisation is nutrients in the mineral form. Plants require nutrients to be in mineral form to take them up from soil. Therefore all nutrients in organic matter must undergo mineralisation before they can be used by again by living organisms. For example consider a protein molecule containing carbon nitrogen, phosphorus and sulphur. When microorganisms mineralise the protein molecule it may undergo several changes to simpler organic molecules before the carbon is converted to carbon dioxide, the nitrogen to ammonium, the phosphorus to phosphate and the sulphur to sulphate. Question 4. What is the immobilisation of nutrients? Immobilisation of organic matter is the opposite process to mineralisation. In immobilisation, mineralised nutrients are incorporated into organic molecules within a living cells. The process of immobilisation is very important because it relocates mineral nutrients into pools within the soil that have a relatively rapid turnover time, making them available to plants and preventing their loss by leaching. Plants are generally not efficient at competing with microorganisms for mineral nutrients in soil. Question 5. What is the C:N ratio of organic matter and why is it important? The C:N ratio of organic matter means the amount of carbon relative to the amount of nitrogen present. There is always more carbon than nitrogen in organic matter. It is usually written as C:N and is a single number, because it expresses how much more carbon than nitrogen there is. For example if the ratio is 20, this means that there are 20 grams of carbon for each gram of nitrogen in that kind of organic matter. If the ratio is 100, it means that there are 100 grams of carbon for each gram of nitrogen. So if the number is low it means that the amount of carbon is reasonably similar to the amount of nitrogen. If the ratio is a large number, it means that there is considerably more carbon than nitrogen. The C:N ratio does not tell us what form the carbon and nitrogen are in, just how much is there. The C:N ratio is important because of what happens when organic matter is incorporated into soils. 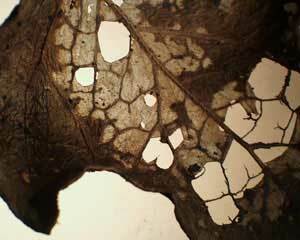 First, the larger organisms like mites and soil animals break it into smaller pieces. 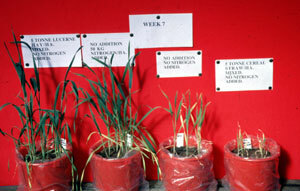 Effect of adding straw to soil that has not previously received straw on plant growth. The pot on the left had legume organic matter added to the soil. The pot beside it to the right had fertilizer nitrogen added. The pot on the right had wheat straw added and the pot on its left had nothing added. Then the fungi and bacteria start to decompose it (they secrete enzymes to break up the chemical compounds it is made of). When the enzymes have disrupted the compounds, the bacteria and fungi can use some of the parts released in this process as nutrients. For example, if the enzyme is degrading a protein, the microbe would be able to use the carbon, nitrogen and sulphur (if there is some) for its own cell wall structure and cellular contents. Excess nutrients to the requirements of the microorganisms are available for other soil organisms or plants to use. The microorganisms can access nitrogen in soil more easily than plants can, so the plants sometimes miss out. This means that if there is not enough nitrogen for all the organisms, the plants will probably be nitrogen deficient and nitrogen addition will be needed to meet the requirements of the plant. This is why incorporating organic matter into soils can change the amount of nitrogen (and other nutrients) available to plants. Incorporating organic matter that has a high C:N ratio will probably cause some nitrogen deficiency in the crops/plants, at least in the short-term.